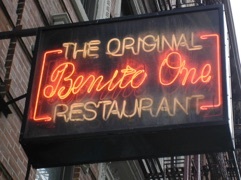 The Original Benito One opened it’s doors in 1968. 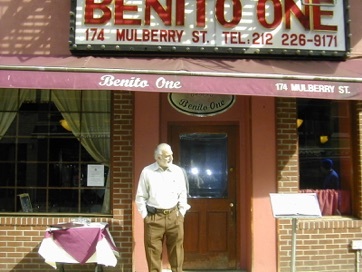 Because of the reputation of Chef Benito it became an instant hit in Little Italy. It started out with only 5 tables in a tiny store front. It hasen’t changed much over the years. The new owners are 2 brothers (Nick and James Bari) who have been in the restaurant business for over 40 years. Born and raised on Mulberry Street and now the proud owners of Benito. Out of respect of Chef Benito they kept the name and pretty much the same menu. The chef that is there has been working in Benito for over 29 years. Nick and James have kept the same cozy and family oriented look of the restaurant. All the pictures on the walls are of thier family, parents, grand parents and great grand parents. They will maintain the look and taste of the original Benito as long as they are there. Nick and James invite you to come and take a look and hopefully become a member of the Benito family.